Andy: Wow, this is really smooth. You can’t taste the alcohol at all. It is less sweet than the Brinley’s Mango, but has a little bite to it. This has a very authentic flavor. Plus, it has fruit in the bottle, so that must mean it is good for you! Adrian: This tastes like I just cut a fresh mango. This is just as natural as the 267 pineapple, with an equally excellent flavor. I actually prefer the Brinley’s Gold Mango for mixing, as the flavor holds stronger with other ingredients, but this is an excellent rum, no doubt. 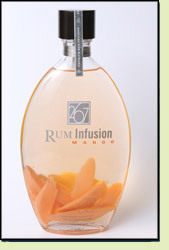 Is 267 rum infusion mango available to be purchased by a consumer?